2 days 1 night: R3650 per person. Depart Cape Town and drive along the scenic coastal road through to Cape Agulhas (Southern point of the African continent) via Hermanus which is the whale watching capital of the world. (June to November) We visit the Southern tip of Africa and the beautiful lighthouse before we head on to the Garden Route Game Lodge. Enjoy Big 5 sunset safari followed by a huge Buffet Dinner (all included). Tonight we stay in beautiful wooden chalets under the clear African skies. Join the early morning game drive to see some of the animals that we maybe didn’t see the evening before. Breakfast follows and after we visit the reptile park and do the Cheetah walk. Once finished we’ll start to make our way back to Cape Town for arrival around 5pm. Budget Garden Route Tours Booking Enquiry Form. Budget Garden Route Game Safari Weekend. 3 days 2 nights: R4650 per person. 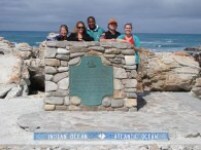 Depart Cape Town at early morning and make our way to Cape Agulhas, the Southern most tip of Africa. Our route takes us around stunning False Bay to Betty's Bay. 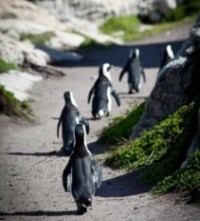 We visit the local penguin colony, Stony Point before arrival in Hermanus. 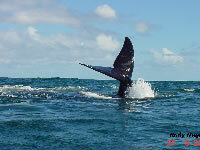 Hermanus is famous for being the best land based whale watching site (June to November) in South Africa. Tonight we stay at Cape Agulhas Backpackers. Departing from Cape Town in an air-conditioned mini-bus with registered tour-guide at 6 am and following Route 62 to Oudtshoorn, the semi-desert area of the Little Karoo. Our first visit on the Garden Route Tour is the Cango Caves where we take a tour and explore these magnificent caves. After which we visit one of the many Ostrich Farms. Here you will learn about the ostrich and even try your luck at riding an ostrich. 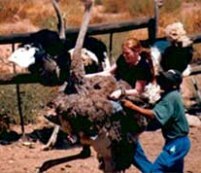 This is the Ostrich Capital of the World. Tonight we stay in Oudtshoorn and have a delicious ostrich barbecue braai for dinner. Join the early morning game drive to see some of the animals that we maybe didn't see the evening before. Breakfast follows and after we'll visit the reptile park. Once finished we start to make our way back to Cape Town for arrival around 5pm. Rates: Garden Route 5 Day Xtreme Tour. - It includes dinners as well as breakfast. - All bedding is provided throughout the tour. All of the above except Addo Elephant National Park and Sundays River. After breakfast we depart over the stunning Outiniqua Pass down to the coast to Wilderness. Along the Garden Route we visit the town of Knysna, the Knysna Heads, the markets and the Waterfront. Travelling through Plettenberg Bay we arrive at Storm’s River Village near the Tsitsikamma National Park. This is where we overnight after dinner in the heart of the Garden Route with a sumptuous and varied buffet dinner is served and we overnight at the lodge. 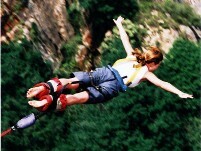 After breakfast we head for the Garden Route Game Lodge stopping at the Bloukrans Bridge to view or take part in the 216m high Bungy Jump (optional). 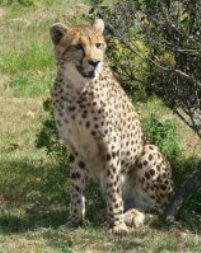 Once at the Garden Route Game Lodge we go on an afternoon Game Drive and have the opportunity to view the many animals - rhino, lion, buffalo, cheetah and a large variety of antelope. A sumptuous and varied buffet dinner is served and we overnight at the lodge. lunchtime we head towards Hermanus and the best land based whale watching site in the world (June-November). We return to Cape Town late afternoon via the stunning False Bay coastline where with luck we’ll see some dolphins to welcome us home. You now have done the famous Garden Route from beginning to end.